Raidlayer Review 2019: Is Raidlayer a Good Hosting? Raidlayer is an Indian web hosting company offering fantastic features at unbelievably low rates. They cater to webmasters of all skill levels with their easy website building tools and advanced developer features. Even though Raidlayer is based in India, they provide web hosting services to those in the United States, Canada, the United Kingdom, Hong Kong, and Turkey as well. Founded in 2014, they’re relatively new in this field but have risen rapidly through the ranks ever since. They now have servers located in five different countries and serve over 4,500 customers worldwide. Raidlayer’s solutions range from basic shared hosting all the way to high-powered managed dedicated servers. Their shared hosting solutions are by far their most popular for their feature-packed nature, however. Each of these come with a 99.9% uptime guarantee, along with free website building tools that enable you to create a professional-looking website with ease. Next up you have their one-click app installer, which gives you an account pre-installed with popular CMSes such as WordPress and Joomla. They include unlimited MySQL databases along with unlimited POP3 and IMAP emails with all their shared hosting packages, so you won’t have to worry about database limitations — unlike with most other hosting providers. They offer support for almost all the latest programming languages you’ll need during website development. With the industry-standard cPanel control panel and Awstats, you’ll have more power and control over your website, so you can effectively manage your account and use the statistics to create future campaigns. If you already own a website and want it transferred to Raidlayer, just get in touch with them and let them do the hard work for you, free of charge. In order to improve the security of their shared servers, a number of features have also been added to each hosting account. These include antivirus and antispam protection, hotlink and leech protection, and automatic backups every five days. Moreover, the servers have redundant power with HVAC and fire detection systems ensuring that no matter what happens, your website stays live. For users interested in creating their own online stores, there are private SSL certificates available as well as dedicated IP support. Software such as CubeCart and osCommerce can easily be installed on the website. One thing I didn’t quite like about Raidlayer, however: the SSL certificate on their website doesn’t extend to their subdomains, which means that if you’re purchasing a hosting package from them and end up on their checkout page, you’ll get a rather unsettling “not secure” notification from your browser. If this is an indication of the same type of SSL certificate they offer their customers, it doesn’t bode well for any e-commerce hosting customers, frankly speaking. Raidlayer has a solid blend of hosting plans suitable for individuals or businesses of all sizes. Their Starter shared hosting package includes 1GB storage and 1GB bandwidth, which means single website owners have access to an extremely cheap hosting option that gives them adequate resources and boatloads of features to establish a basic online presence. The Business and Premium packages offer limited but adequate storage and bandwidth as well. However, it was the Advanced package that really caught my eye. It offers unlimited storage and bandwidth for an unbelievably low price. When you select a shared hosting package with Raidlayer, you can choose from either an Indian data center location or U.S. location. Choosing a server located closer to your target audience gives you lower latencies and better chances of ranking highly in your local search engine databases. You also get a 30-day money back guarantee with Raidlayer’s shared hosting packages, so you can safely try out their service risk-free. Their support staff can be reached by telephone, email, and live chat. Unfortunately, their ticketing system is currently down; when I tried to access it, the webpage didn’t load at all. At the time of writing, their live chat was also offline. It seems they only offer the live chat during working hours, even though on their About Us page, they claim to have 24/7 customer support. Despite their newness in the web hosting industry, Raidlayer offers great packages and services. Since they offer a 30-day money back guarantee, there’s no harm in trying them out and getting a taste of their services before long-term commitment. 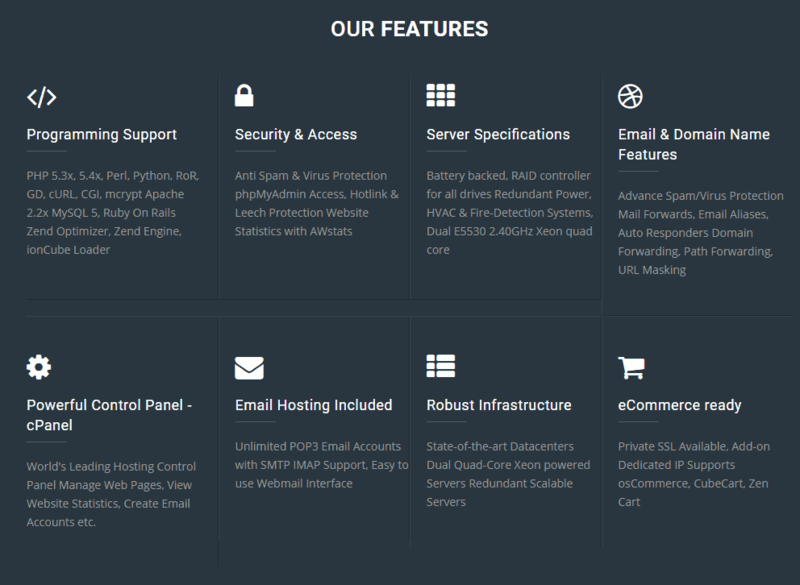 Wondering how Raidlayer stacks up against other Web Hosting companies? Enter any other Web Hosting company and we will give you a side-by-side comparison.